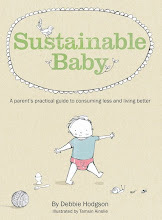 Sustainable Baby had a fun review in the online magazine Bonzer! - "by, for and about wise elders". The priorities for this modern mother are interesting as reflected by page lengths—33 pages on home cooking, 25 pages on nappies, 19 on health, 17 on enjoying playing with baby (hurrah! ), 15 on buying and saving, and 14 on tips about clothing, with appendices about making things. No need to hassle about how these sustainable babies sleep or misbehave. Debbie interestingly gives the first 25 pages to nappies, [diapers] including useful advice about how overseas babies respond to having no nappies, and the real comparative green-ness of cloth versus disposable. I really liked this sensible, intelligent and funny review.